The value of Beanie Babies is something many people wonder about at one time or another. Whether you have found one for pennies at a thrift shop or you are wondering if your 1990s collection is still worth anything, there are ways to find out. There are several factors that contribute to the final value of Beanie Babies. When the Beanie Baby craze was at full swing it was not unusual for a particularly popular Beanie to sell for hundreds of dollars. People are willing to pay for what they want so a popular character can fetch much more than a less desirable one. It is hard to say what factors make a particular item so desirable to so many. Often it was a particular look or a character, like Princess the Bear (created in memory of Princess Diana), that was created in honor of a particular person or event. Like all antiques and collectibles, condition is an important factor in the final value. Mint - Character shows no signs of wear or defects and has the both the hang tags and tush tags intact. Near Mint - The tags might be slightly worn or bent but the character is in perfect condition. These sell for 80% to 90% of the price of the same toy in mint condition. Excellent - The tag may be creased or worn. The character itself will still be in perfect condition. The fair price on a beanie in excellent condition would be about 65% to 75% of the mint price. Very Good - The tags are very worn, torn, or missing completely but the character is still in perfect condition. You can expect to price this at about 40% to 60% of the mint price. Damaged or Played With - These would be the Beanie Babies that were played with. The fabric might be worn, tags may be missing, or there may be repairs. You can expect this category to sell for about 5% to 25% of the mint price. 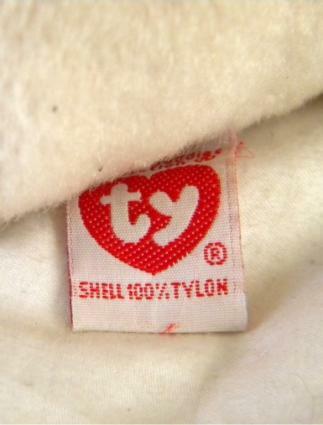 Beanie Babies were often retired after a certain number were produced. A retired Beanie Baby will usually fetch more at auction than one in current production. To check and see if your Beanie is retired you can check the Ty website. You will also need to identify the hang tag to see which generation of Beanie it is. The toys were made in "generations" and the first generation will be more valuable than the ones that follow. The first generation was introduced in 1993 and is generally the most valuable. Hang tags can be identified on this helpful eBay website. You can expect to get a higher price for a Beanie Baby at an auction that is for Beanie collectors than you can at a garage sale or on eBay. It may take longer to sell through a Beanie Baby auction house or a website for collectors but the higher price you get will be worth it. You can check out sites like SmartCollecting. It is important to pick up a good price guide. One of the most current ones is Warman's Bean Plush Field Guide: Values and Identification. A price guide should be no more than two years old in most cases for you to get the more accurate evaluation. Other ways to estimate the price of your Beanie is to check online venues to see what the character you have has sold for. Of course if you have a collection of Beanies, you will want to protect your investment and the value of them by taking good care of them. Hang tag covers can keep the tags in pristine condition, while displaying them in a glass front case out of direct sunlight will keep them bright and fresh. They should not be played with if you plan to keep them or sell them as collectible items. The value of these collectibles will go up and down over the years. Keep an eye on the market and if you plan to sell try to do it when there is more of a demand.